Welcome to my website! I am a professional freelance make-up artist in the very fortunate position of making a living from my passion, and count my lucky stars every day! 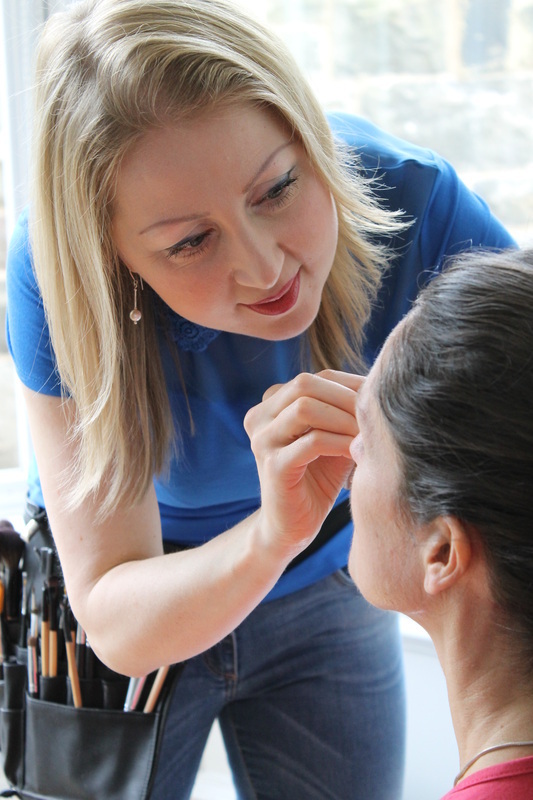 I offer a friendly, professional and fully insured mobile make-up artistry service in Edinburgh, where I am based, and am happy to travel anywhere in Scotland, and further upon request. From a very young age, I have had a passion for make-up, experimenting on myself and others, and have always been one of those go-to friends for make-up application and handy tips. As a graduate, I started my career at Procter & Gamble in London. Working as a Colour Expert, I worked on cosmetic brands such as Max Factor and Oil of Olay. Here, I had the amazing job of designing and bringing to market the new upcoming seasonal trend shades for these and other brands, and gained so much product knowledge whilst working there. Following this, and after a successful career in management, I decided to pursue my dream of working as a make-up artist in Edinburgh and have never looked back. I strongly believe in investing in my craft by continual development within this fast moving industry, staying up to date with the newest trends, techniques and products. For example, I invested in a series of makeup artistry courses at the Lauren Gollan Academy of Make-Up Artistry, to hone my skill set and knowledge on the latest trend led techniques, as well as training at the Academy of Makeup. My promise to you is to deliver a high standard of care and professionalism, reliability and trust, with the primary focus being on you. Being very passionate about make-up and what I do, I always strive for perfection in the service I offer to my clients. I am happy to travel to you to do your make-up in the comfort of your own home or location of your choosing, making life easier for you. All you need to do is sit back, relax and enjoy being pampered! I believe everyone has their own unique sense of style and look, and enjoy offering an exclusively bespoke & professional service. If a client wishes, I can incorporate the current trends into their make-up application also. I really enjoy making my clients feel beautiful, confident and comfortable with whatever look they have chosen, leaving for their event looking flawless and feeling a fabulous version of themselves. I am always amazed how well applied make-up that enhances the person's natural beauty, can transform and give a person confidence to take on the world. ​To learn more about the products in my kit that help make the magic happen, click here. To read all about my business featuring in various press and publications, click here. Check out my Exciting News page to learn about some rather exciting things that have been happening. To hear more from my lovely clients and their experience of my services, please review my Testimonials page. So if you are looking for a professional make-up artist for your wedding make-up, need to look fabulous for a special occasion or want to learn more about how to apply your own make-up through a make-up lesson or bridal tutorial, then feel free to get in touch via my Contact page. I would love to show you what make-up can really do for you!